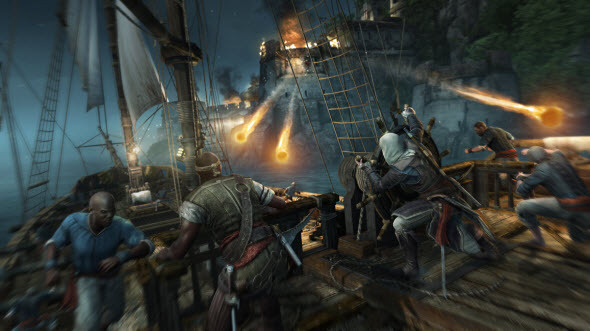 Recently Eurogamer has had an interview with the developers from Ubisoft studios, and yesterday the journalists presented new Assassin's Creed 4 gameplay video with the commentaries of game's producer. In this video you can see the naval battles and the siege of the forts. 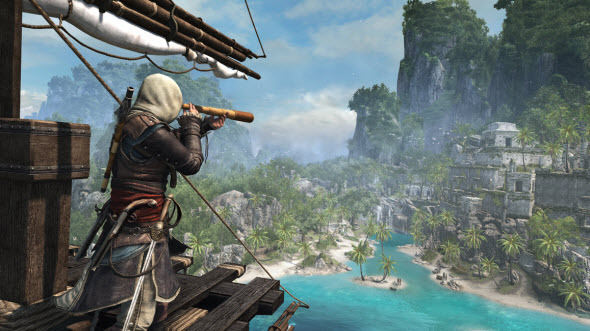 New Assassin's Creed 4 gameplay video tells us more about the naval adventures of Edward Kenway. It became known that in the game there will be about 50 various locations and 11 different forts. Each fort is an important strategic point on the Edward's map, so only after you seize the certain one, you can move forward and continue exploring the game's open world. If you are going to conquer some fort, be sure that your ship is strong enough, because the defence of strongholds is very good. But with the right equipment and thought-out strategy you will be able to seize any fortress. After destroying the cannons, you will have to kill the commander of the fort, and then this fort will be yours. You will be able to use it in your war and also to open new side missions here.